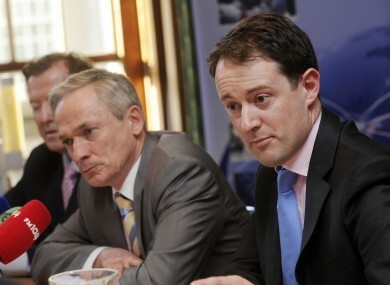 Richard Bruton plans to sign legislation being prepared by his junior innovation minister, Sean Sherlock. A DÁIL DEBATE on Seán Sherlock’s controversial proposals for new laws on online copyright is to be held on Tuesday. A 50-minute session of statements on the “proposed amendment to Section 40 of the Copyright and Related Rights Act, 2000” has been pencilled in for Tuesday evening, beginning shortly before 6pm. The discussion, made as a late amendment to the Dáil schedule by the party whips today, will allow TDs to raise their concerns over the proposed new laws, which will give copyright holders the right to seek a court injunction blocking access to copyright-infringing websites. The arrangement comes after Sherlock, the junior minister responsible for innovation, last night agreed to hold a Dáil debate before the new legislation was signed. Sherlock told the Dáil yesterday that he remained committed to implementing new laws, but that he was not opposed to primary legislation on the issue – which would require the approval of the Dáil and Seanad before it could be passed. As it takes the form of a statutory instrument and not a full Act of the Oireachtas, the current draft of the new law does not need Oireachtas approval – and is given legal effect simply when it is signed by the relevant minister. A brief debate was held on the subject in the Dáíl during yesterday’s Topical Issues session, but was limited to 15 minutes because it was not possible to fit more time into the previously agreed schedule. Sherlock had committed to introducing the new law before the end of the month, but has pushed it back after a major groundswell of from internet users who have dubbed it the ‘Irish SOPA’ because of its wide-ranging potential ramifications. The fears over the plans’ possible effects had prompted attacks on the websites of two government departments from members of the Anonymous movement earlier this week. The legislation is being brought forward in order to resolve a legal vacuum created by a High Court ruling which said Ireland had not offered legislation in line with an EU directive on copyright protection. In a case taken by EMI Ireland against the internet provider UPC, Justice Peter Charleton said that while allowing access to certain filesharing websites enabled a breach of intellectual property, Ireland did not offer a legal means for an injunction to be sought – a right provided under EU directives. Email “Dáil to discuss proposed 'Irish SOPA' legislation next Tuesday”. Feedback on “Dáil to discuss proposed 'Irish SOPA' legislation next Tuesday”.